Beyond Hubble: Will Future Space Telescope Seek Alien Life by 2030? NASA’s Hubble Space Telescope in 2009. 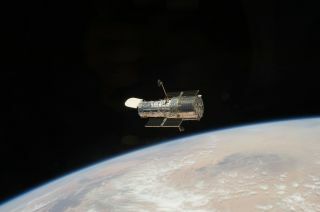 Astronauts on NASA's space shuttle Atlantis captured this farewell photo of Hubble near the end of the final servicing mission to the telescope. The iconic Hubble Space Telescope turns 25 this month, and getting the ball rolling on a life-hunting successor instrument would be a fitting birthday present, one prominent researcher argues. Hubble, a joint project of NASA and the European Space Agency (ESA), blasted off aboard the space shuttle Discovery on April 24, 1990. Spacewalking astronauts fixed a serious problem with the telescope's optics in 1993, and Hubble has been transforming astronomers' understanding of the cosmos — and bringing gorgeous images of the universe into laypeople's lives —ever since. "Hubble images have become part of our culture," Livio told Space.com. "I regard this as an incredible contribution." While the venerable Hubble will likely be able to keep studying the heavens for at least five more years, it's now time to start planning out a future space telescope that will tackle the next big frontier in space science, Livio says — the search for signs of life beyond our neck of the cosmic woods. "Hubble has taught us that to answer the most intriguing questions in astrophys­ics, we must think big and put scientific ambi­tion ahead of budgetary concerns," he wrote in a commentary piece published online today (April 15) in the journal Nature. "In my view, the next priority should be the search for life beyond our solar system," Livio added. "A powerful space telescope that can spot biological signatures in the atmospheres of Earth-like exoplanets would be a worthy successor." Hubble's immediate successor is NASA's $8.8 billion James Webb Space Telescope (JWST), which is due to launch in 2018. The infrared-optimized JWST will be able to study the atmospheres of some nearby planets discovered by the Transiting Exoplanet Survey Satellite, or TESS, which NASA aims to launch in 2017. The agency is also developing a potential space-telescope mission called WFIRST/AFTA (short for Wide Field Infra­red Survey Telescope–Astrophysics Focused Telescope Assets). WFIRST/AFTA, which could launch around 2024 if it gets the final go-ahead, would continue the hunt for biosignatures, among several other major tasks. Such a powerful instrument could scan the skies of enough Earthlike exoplanets to place "meaningful statistical constraints" on the abundance or rarity of alien life throughout the Milky Way galaxy, according to Livio. "A large sample of planets — around 50 — would have to be tested," he wrote in the Nature commentary. "Calculations show, for example, that if no biosignatures are detected in more than about three dozen Earth analogues, the probability of remotely detectable extrasolar life in our galactic neighborhood is less than about 10 percent." "First, NASA, ESA and other potential international partners should convene a panel to examine such a project," he wrote. "Technology-development studies should be accelerated to make a launch around 2030 plausible. The search for life must be prioritized in the next U.S. and international decadal surveys that guide national funding decisions about missions." Livio said he's not advocating any particular design for such a space telescope; he just wants to inspire his colleagues to "think big," and to build some momentum for a mission that could help humanity better understand its place in the universe. "Many scientists would agree that the question of, 'Is there extrasolar life?' is one of the most intriguing questions in science today." Livio told Space.com. "So let's try to actually answer that question, and do what it takes to answer it, as opposed to maybe taking baby steps that would just push the answer into the more distant future."